In arguments about music, books, cinema, painting or whatever artform you care to mention, the topic of artifice versus authenticity never seems far from the surface. My opinion, of which I dare say any regular reader will be well aware, is that such arguments are bunkum. In a mediated world of real, not real and fiction, not fiction then the only things we can trust are the heat of the sun on our limbs and the chill of the ice on our tongues. "The only thing real is waking and rubbing your eyes" indeed. Jeff Wall knows this and hinges his work upon this very thread. Photography, that time-honoured medium through which the illusion of ‘truth’ has traditionally been delivered is, in his hands, moulded into lies and deceptions. Convincing, beautiful, epic even, but untruths nevertheless. His ‘Volunteer’ from 1996 is a fine example wherein Wall creates in a single still image a distillation of memory, observation and experience. 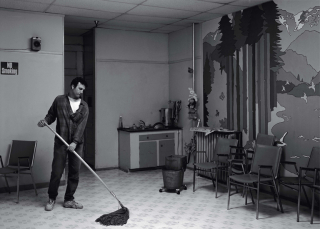 On the surface the image appears to be documentary; a glimpse into a moment of the ‘volunteer’ of the work’s title, routinely cleaning the floor of what appears to be some kind of social facility. The room looks ‘real’, the moment entirely believable. And yet the ‘truth’ is that this room is a stage-set where the mural (a replica of one seen in a homeless shelter) has been painted specifically for the purpose of this photograph and where the ‘volunteer’ is as much a carefully choreographed prop as the mop he handles. Like Cindy Sherman’s ‘Film Stills’, to which Wall’s work from this period obviously nods in acknowledgement, this photograph is cinematic in intention, preparation and execution. I can see it as a still from, say, Jim Jarmusch’s ‘Stranger Than Paradise’ and indeed is there not a similar tension in Jarmusch’s films between mediated authenticity and surreal unreality? The clues to the staging are, one might argue, hidden in plain sight. Such tonal perfection and compositional exquisiteness do not occur by accident, after all. Ultimately then Wall’s work gives lie to the idea that photography is a medium of honesty and truth. It instead gives weight to an idea that says the artists’ role is not to merely hold a mirror up to life and the world, but to subtly intervene such that the stories, the myriad truths and interwoven realities are instead crafted such that they become simultaneously clearer and more confused. When I listen to the playlist of this series one the things that strikes me is the occasional sharp shift in genre from one song/year to the next. Often this is completely at odds with the reality of my listening, where a mix of styles and sounds blends together across the days, weeks and months of a year. Stylistic ebbs and flows. A bit of minimalist electronica here, a dash of Sunshine Pop there. A sprinkling of Jazz and a dollop of Glam. In 1996 however there really did seem to be a strange and sudden punctuation point; a point at which the predominantly dark and urban growls of jungle and hip hop gave way to the sound of suburban whispers and pastoral pop. It was all Michael White’s fault really (and it was a wonderful twist of history that led to him penning the definitive Sarah story), for he had sent me tapes from way over on the East coast of Canada that were filled with new songs by bands who were pretty much on my own doorstep. It surprised me that groups were still making this kind of sound. Two groups on those tapes really stood out though: Yummy Fur, who sounded like Fire Engines with a mouth full of Bazooka Joe and Belle & Sebastian who sounded like nothing on earth. Some of course would say that Belle & Sebastian circa 1996 actually sounded like an indentikit indie band, all fey whimpers and hiding behind fringes, yet those who might have suggested such things were clearly missing the point. The point being that in Belle & Sebastian we suddenly had a group who, yes, certainly evoked thoughts of previous pop highlights such as Pale Fountains, Orange Juice, Felt, Weather Prophets, Servants (or any other combination of bands on Stuart Murdoch’s infamous ‘Bowlie’ tape as documented in Stuart David’s glorious ‘In the All Night Cafe') yet who crucially really did not sound at all like any one of those influences. ‘Suddenly’ is the vital word here, for Belle & Sebastian really did appear almost fully, perfectly formed. It was as though someone had sat down and plotted how to create the ultimate ‘indie’ band, complete with self-myhtologised back story (and in comic strip format to boot!) and rules of engagement (no encores; publicity photos that did not feature band members; the drummer heading up interviews). Belle & Sebastian immediately gave glorious lie to the notion of ‘indie’ authenticity. Here was a group as carefully constructed as The Monkees or Take That but with the key difference being that there was no svengali behind the curtain pulling strings. Infamously of course the group made waves by winning a Brit Award thanks to being the first group to leverage an Internet savvy fanbase. As such, Belle & Sebastian were perhaps the first band for a socialised, networked age (crucially, their fan base was one who previously networked via fanzines and frenzied letter writing – thus they took to the tools of the Internet like ducks to water). Certainly Belle & Sebastian were a group who knew the value of gang sensibility (as opposed to Gang mentality). The fact that they made such exquisite records was certainly a valuable bonus. ‘Stars of Track and Field’, the opening cut on their now widely and rightly celebrated second album certainly still sounds as delicious today as it did when it first emerged, trembling yet quietly assured from Michael’s tape. It is a song that grows in confidence as it moves forward with the loneliness of the middle distance runner: An energy saving first few hundred meters; a glance at the competition as it breathes deeper and accelerates imperceptibly; stride lengthening as it enters the final lap to culminate in, if not a sprint to the line, at least a profoundly secure romp home. Nobody else is in the finishing straight.